Does Samsung Galaxy Note 3 Have DVD-ROM? Both Galaxy Note 3 and Note 4 are geared up with 5.7-inch Full-HD Super AMOLED display, which is among the best displays so far. The screen is large enough, but not for holding a DVD-ROM, neither for other mobile phones by far. Possible to Play DVD on Galaxy Note 3? * Get Note 3 away from viruses, adware, spyware, etc during online video playing. 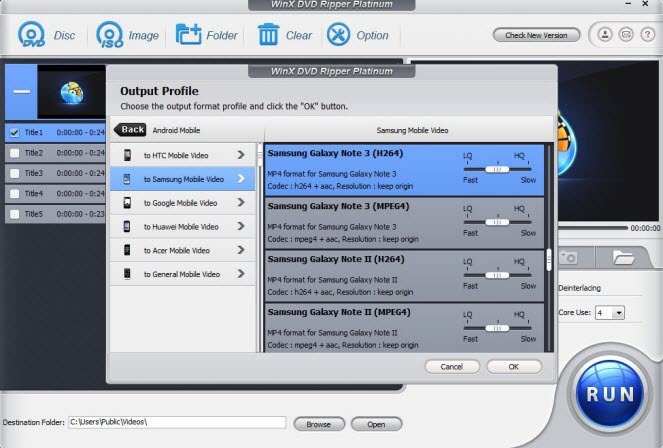 How to Play DVD Movies on Samsung Galaxy Note 3? Ripping DVD to Galaxy Note 3 that runs Android 4.3 Jelly Bean is the best way to realize playing DVD movies on the Samsung mobile that features a 1080x1920 pixels display, Samsung's Exynos 5 Octa 5420 processor and 3,200mAh battery that should deliver all-day use to most people. 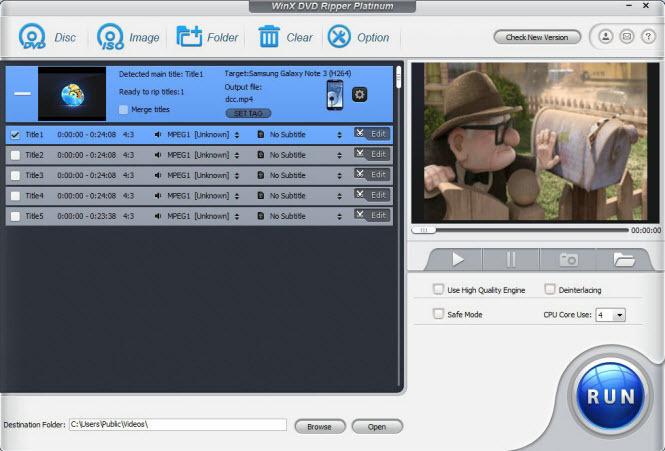 If you are a Windows PC user, please choose WinX DVD Ripper Platinum, a popular choice of public and editors. WinX DVD Ripper Platinum is the No.1 fast DVD ripping software that allows to rip DVD to Samsung Galaxy Note 3, as well as Galaxy Note 2/4/5, Galaxy S3-S6, Note 10.1, and iPhone, iPad, iPod, Apple TV, HTC, WP8, Surface tablet, PSP, PS4, Xbox, etc. It can also convert DVD to MPEG (2,3,4), H.264, AVI, WMV, MOV, FLV, ISO image and more. Please download the Mac DVD Ripper if you are using Mac computer. Preparation: Download and install WinX DVD Ripper Platinum, close other similar and unnecessary programs, and run the software on your PC. Insert any kind of DVD to your DVD-ROM of computer, click "DVD Disc" button on the software UI and import the movie. The DVD ripper can auto select the main DVD title for you. Select a path to save the converted DVD, make sure everything is ready and hit RUN botton. After completing ripping DVD, you can transfer the video to your Samsung Galaxy Note 3 with the data cable. More than Ripping DVD to Samsung Note 3? Both WinX DVD Ripper Platinum and WinX DVD Ripper for Mac can supported the latest copy protected DVDs and is able to Insurgent, The Gunman, Chappie, Kingsman: The Secret Service, The SpongeBob Movie: Sponge Out of Water, McFarland, USA, Jupiter Ascending, Taken 3, Fifty Shades of Grey, The Wedding Ringer, The Hobbit 3, The Gambler etc. The Windows/Mac DVD ripper has many other useful and interesting features, such as merge several movie titles, add external subtitles, adjust audio/video parameter settings, and trim videos.